Pacific Northwest Coast culture-bearer and storyteller Johnny Moses will appear at the Center for Spirituality & Sustainability on Saturday, November 5 from noon to 3PM. He will present stories, songs, and teachings of Native Northwest. The event is suitable for all ages. Guests can attend all or part of the event. Free parking is available on Saturday in Visitors’ Lot B. The event is free of charge and donations are appreciated. Moses will appear also on Sunday, November 6, from 1 to 3PM in Alton, at the store called It's Raining Zen in the Mineral Springs Mall, 301 East Broadway. Johnny Moses has ancestry from several tribes of Washington and British Columbia. 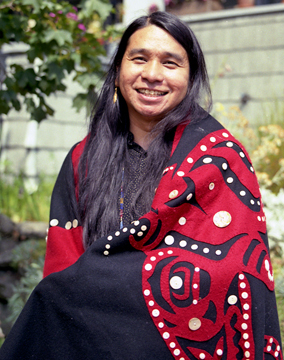 He is enrolled with the Coast Salish Tulalip Tribes near Seattle. He is a traditionally trained cultural practitioner and memorizer of oral tradition. In 2012 he received the Washington Governor’s Heritage Award. Moses and SIUE Professor of Philosophy Gregory Fields have collaborated for more than two decades. Their current project is a book and media collection under contract with the University of Nebraska Press: “Sacred Breath: Pacific Northwest Medicine Teachings, Stories, and Epics.” Moses’ audio collection, produced by Fields, “Medicine Songs of the Four Seasons from the Straits and Coast Salish,” is forthcoming from Smithsonian Folkways. The events are sponsored by the Red Cedar Circle of Southwestern Illinois: a spiritual fellowship and study group that meets at the Center for Spirituality and Sustainability. Meetings are held on the first Saturday afternoon of each month (except January and July), starting at noon. All persons of open mind and heart are welcome to attend. Moses first visited Edwardsville in 1996; this will be his sixth visit. For information, contact Prof. Greg Fields: gfields@siue.edu 618.692-6492.